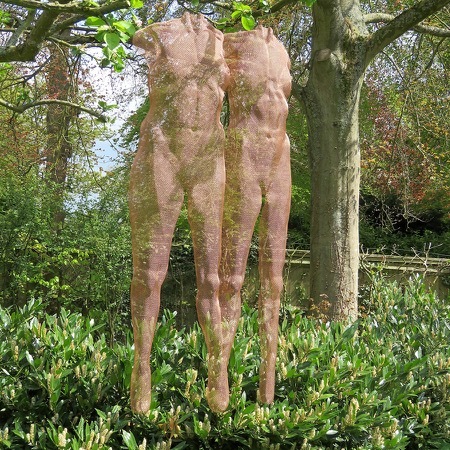 The Private View will happen early June - please contact the Hannah Peschar Sculpture Garden for an invitation! 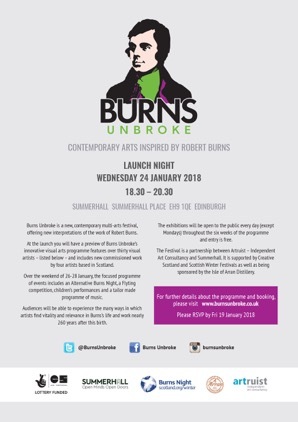 ‘Burns Unbroke‘ is a pilot for a contemporary multi-arts festival, exploring new interpretations of the life and work of Robert Burns, supported by Creative Scotland and takes place at Summerhall, arguably the most exciting festival venue in Edinburgh. The project‘s innovative visual arts programme will feature over 30 visual artists. In addition, the focussed programme of events includes an Alternative Burns Night with Neu! Reekie!, spoken word performances with Flint & Pitch and music programmed by Jamie Sutherland of Summer-hall’s Nothing Ever Happens Here live music initiative. Interdisciplinary is at the heart of this project and new synergies will be offered to a diverse audience, providing a unique experience of contemporary interpretations of Scotland’s national bard. The visual art will be on display in 11 galleries for six weeks, from 25 January – 10 March 2018, with the majority of performance events focussed around the weekend of 27/28 January. 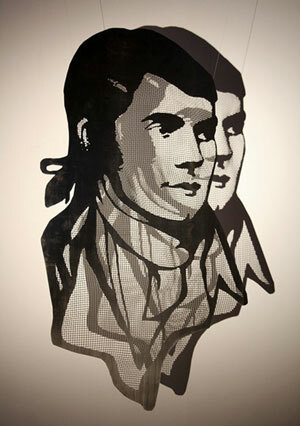 One of the exhibitions will be ‘As Ithers See Him‘ – contemporary interpretations of Robert Burns’s appearance. 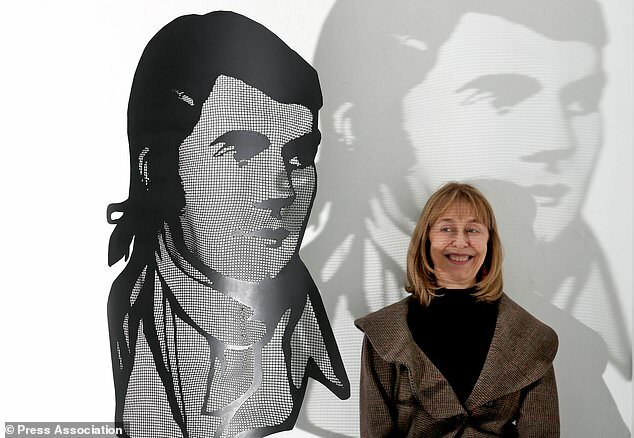 I am delighted to take part exhibiting my contemporary ‘Burns‘ portraits (limited edition). Many thanks to Sheilagh Tennant for inviting me to exhibit. 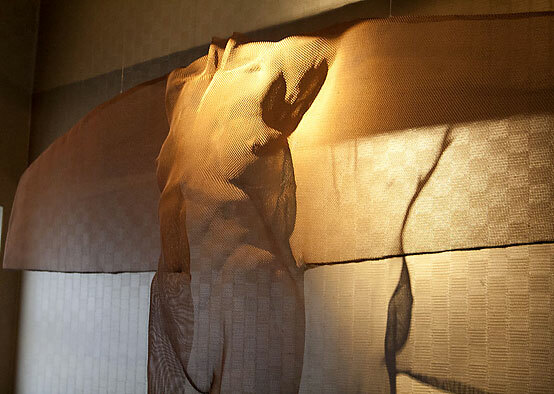 More images of steel sculpture ‘Burns‘ on page Panel Sculpture. Shadows and Light is a contemporary exhibition at Byard Art featuring exciting pieces by a wide range of artists. Come and visit Cambridge to see the stunning imagery created under the theme of light and shade. The art exhibition includes a selection of my wire-mesh and steel-panel sculptures. 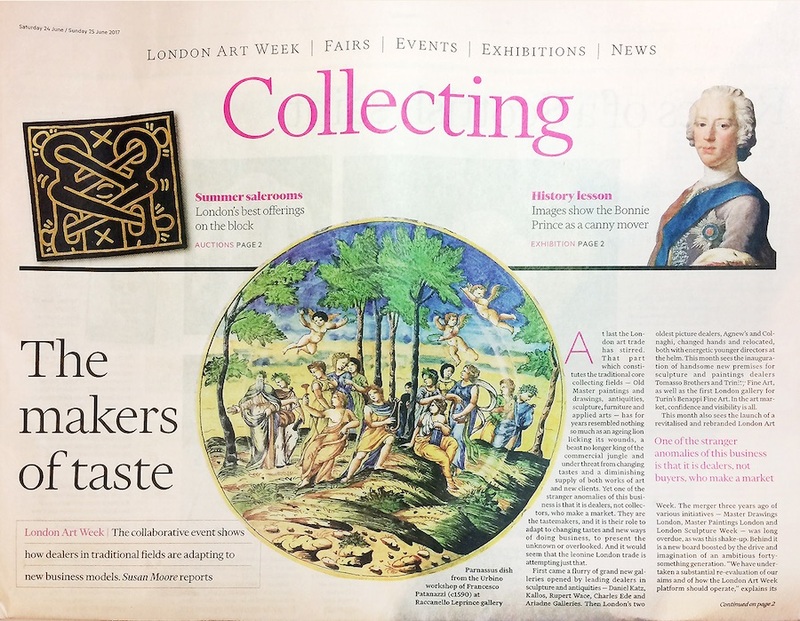 ‘Shadows of the Past‘ is an exciting and very unusual collaboration for ‘London Art Week‘ combining artefacts from the past with contemporary sculpture. I will be making new sculpture for this joint exhibition inspired by renaissance ceramics, presented by Bazaart who will display my work together with Renaissance pottery at ContiniArtUK, New Bond Street. 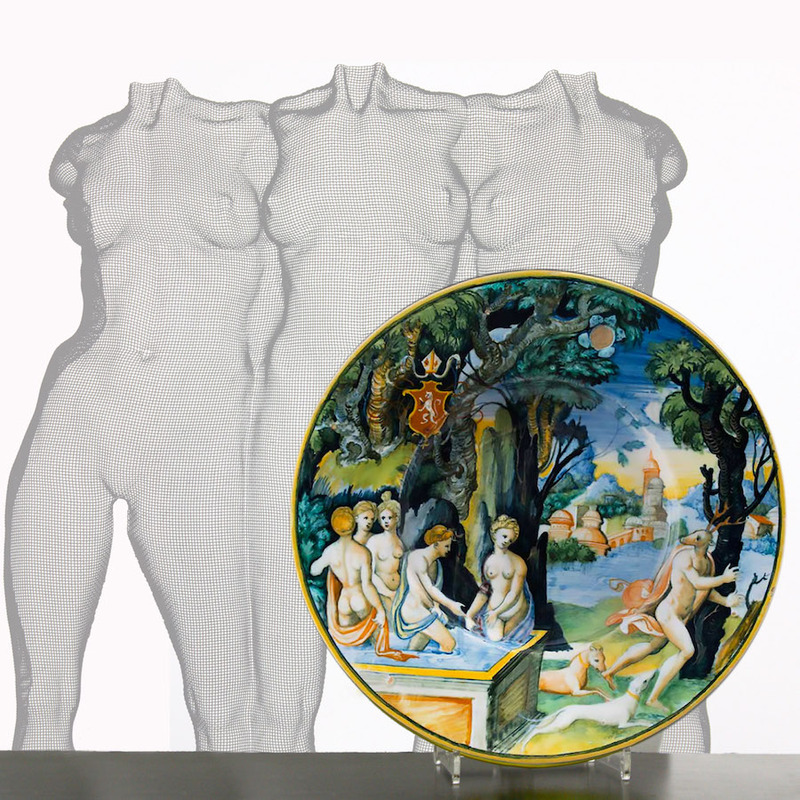 Camille Leprince and Justin Raccanello's choice is highly selective: quality, rarity, condition and the impact of each ceramic is attractive to a modern public, collectors, connoisseurs and museums as much as young clients who might have never explored early European ceramic art before. 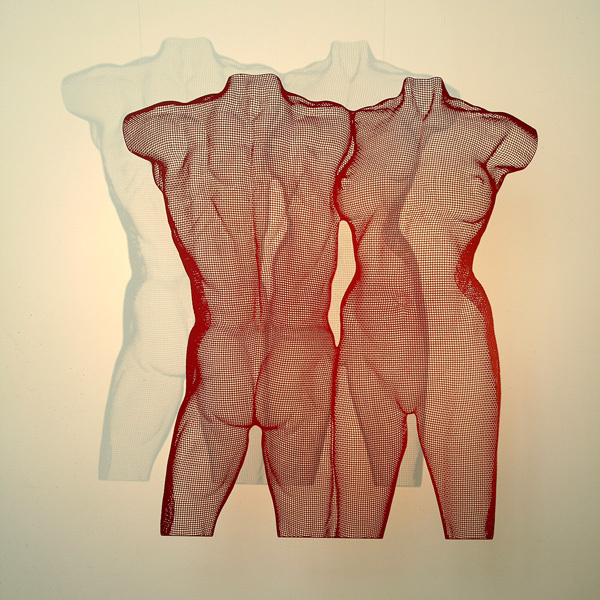 with a selection of abstract and figurative mesh sculpture! 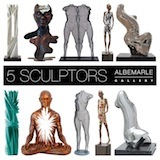 A retrospective sculpture exhibition spanning 30 years of solo shows. Following on from a very successful presentation of my sculpture at Arte Fiera, Bologna earlier this year ContiniArtUK are presenting a retrospective sculpture exhibition spanning 30 years of my artwork (sculpture, drawings and monoprints) 1987 to 2017. To commemorate this exhibition a new catalogue features all artworks from this exhibition. Many thanks to Cristian Contini and all at ContiniArt UK for making this exhibition possible. 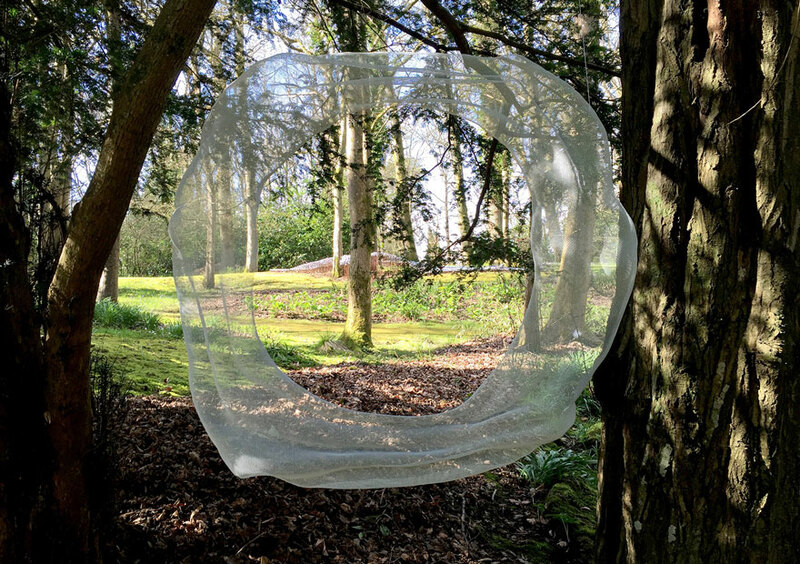 I am exhibiting an outdoor sculpture in bronzemesh at the Garden Gallery for the very first time and many thanks to Rachel Bebb for inviting me. New artists this year are also Lisi Ashbridge, Sadie Brockbank MRBS, Anne Curry MRBS, Paul Donovan, Mark Evans, Rowena Gilbert, Joseph Hillier MRBS, Eric Marland, John Neilson, Jane Rickards, Tim Royall and Mark Stonestreet. Making a Mark is a celebration of craftsmanship. 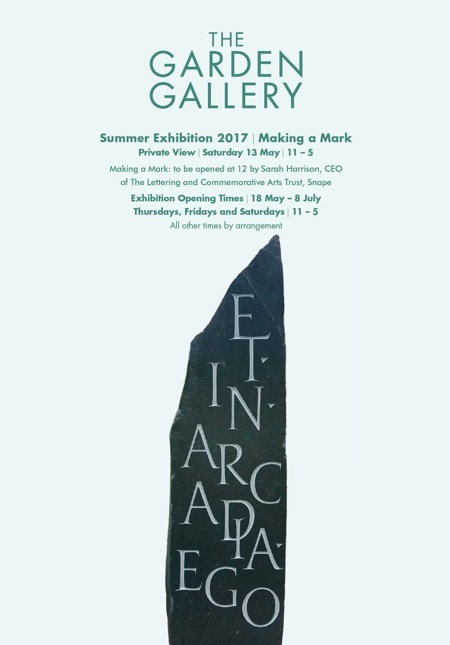 At the Private View on 13 May the Lettering Arts Trust in Snape will have a display about its work and some of the letter carvers exhibiting in Making a Mark will demonstrate their skill. The Garden Gallery is liaising with the Association Culturelle Barneville-Carteret in Normandy which holds regular exhibitions of sculpture and painting. Roger Stephens MRBS will exhibit at ArtBC for two weeks in June. Thursdays, Fridays and Saturdays | 11 – 5, all other times by arrangement. 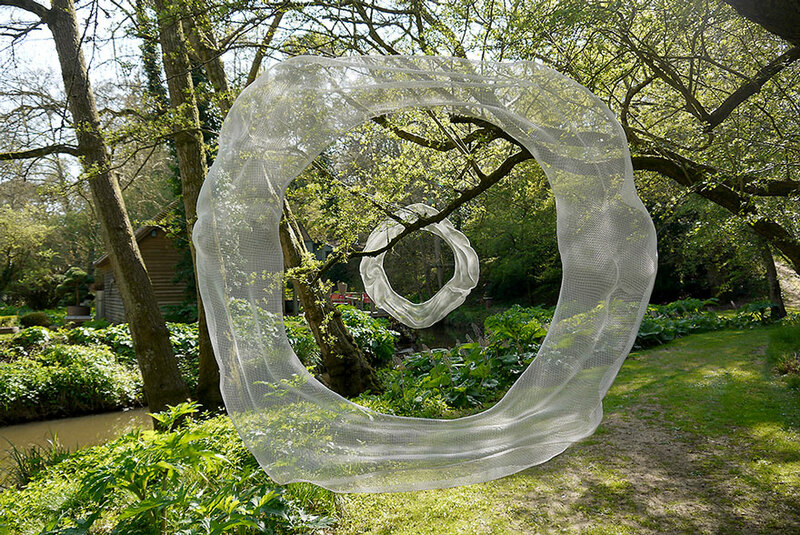 The Garden Gallery is also exhibiting sculpture at The Grange Festival in June. This fabulous feast of opera takes place at Grange Park, near Winchester. The beautiful park has been restored to its Arcadian splendour by eminent landscape architect Kim Wilkie. 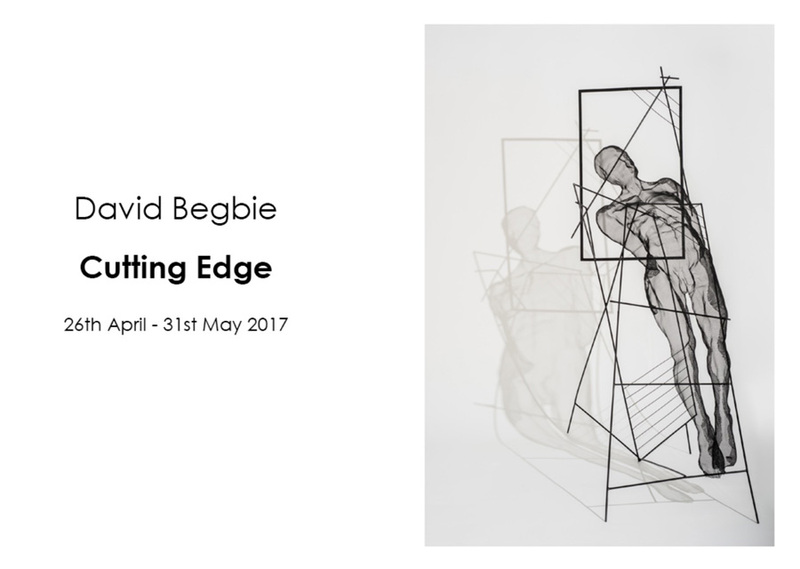 Exhibiting sculptors include Salvatore Anselmo, Charlotte Mayer FRBS, Sally Fawkes MRBS and Richard Jackson MRBS, Peter Randall-Page FRBS, Jon Buck MRBS and Shelley Robzen MRBS, alongside paintings by Deborah Gourlay. 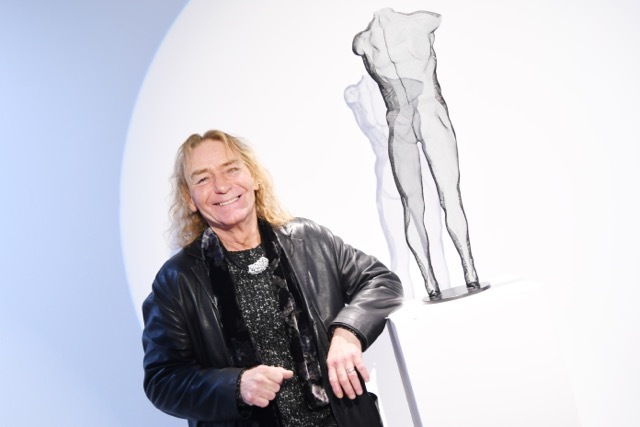 2017 Art Style Magazine: "The World's Leading Wire Mesh Sculptor"
Online Auction and Gala Night for "The Project Polunin"
CZIN 2016 – a male back sculpture, freestanding on metal base, black finished steelmesh, 75cm height. Above image opens more photographs. 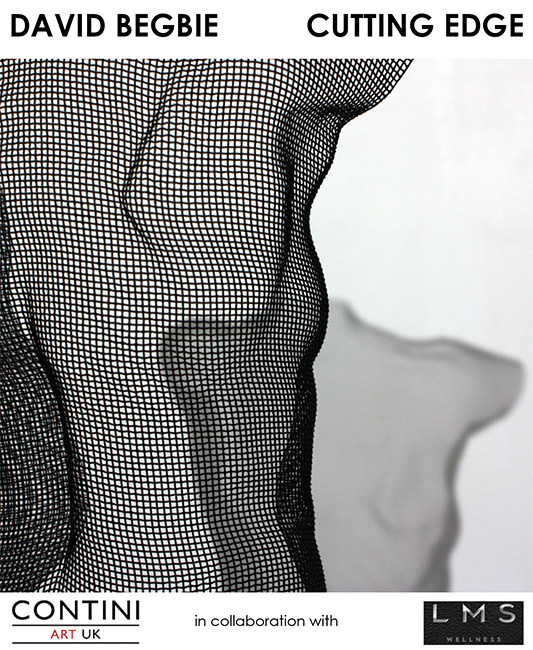 This latest steelmesh sculpture is one of the recent series of single figurative forms both male and female whose subjects are contemporary archetypal expressions of masculine and feminine. CZIN has a particular poise and posture expressing fitness, strength and balance often witnessed in the discipline of contemporary dance and ballet. Ukrainian ballet prodigy Sergei Polunin trained at the Kiev Choreographic State School and The Royal Ballet School before joining The Royal Ballet, where he rapidly rose through the ranks, becoming their youngest principal ever. Project Polunin is a triple bill of classical and modern pieces. The programme at Sadler’s Wells will include the UK premiere of Vladimir Vasiliev’s Icarus and Tea or Coffee, a company piece choreographed by Andrey Kaydanovskiy. The programme will also feature the world premiere of Echo and Narcissus, a piece co-created by Polunin in collaboration with composer Ilan Eshkeri and photographer and artist David LaChapelle. Polunin previously collaborated with LaChapelle, performing in his interpretation of Hozier’s ‘Take Me to Church’. Eshkeri wrote the music for Polunin’s biographical film Dancer, a film about Sergei Polunin’s life and work that will be released in UK cinemas on 10 March. aims to raise funds for a new Project Polunin Production that will premiere at Sadler's Wells, On this site you will find all the necessary information on the Gala and how you can support this amazing Project. Bidding will resume at 18:00 on Thursday 23rd February 2017 for event attendees only. If you are not attending the event we encourage you to use the ‘Maximum Bid’ feature in order to increase your chances of winning auction items. 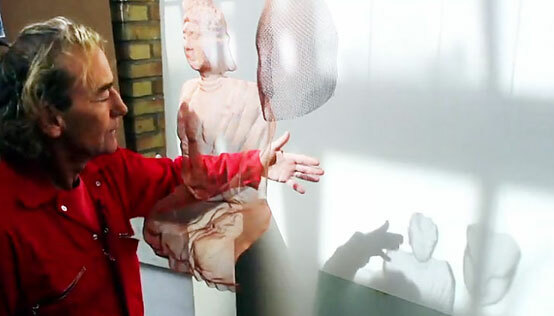 Self-taught Frances Segelman has reached the top of the sculpting profession having sculpted a wide variety of public figures including HM The Queen, HRH The Duke of Edinburgh and HRH The Prince of Wales. An established sculptor of personalities from the world of entertainment, politics and sport Frances Segelman’s recent commissions include Boris Johnson, Lord Julian Fellowes and Joanna Lumley. 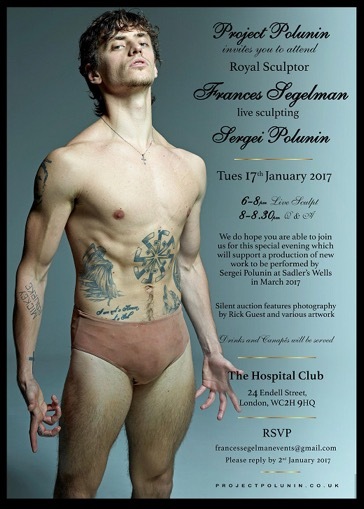 Frances Segelman's sculpting event at The Hospital Club includes photographs of Sergei Polunin by award winning photographer Rick Guest, wire mesh art by internationally renowned sculptor David Begbie and life drawing by artist Victoria Perloff. 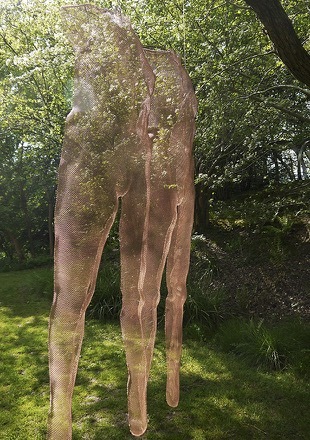 Heralded as the first of it's kind in the UK, The Hannah Peschar Sculpture Garden has been proudly exhibiting contemporary sculpture in a unique and magical environment for over 30 years. I am happy to exhibit sculpture TUUSUM, SQUERE, CIRCA and CIRUM in this beautiful park. The garden is open on Thursdays throughout the summer, as well as Friday to Sunday. Changes: Owner and curator Hannah Peschar of the renowned sculpture garden Surrey has stepped back to allow a new pairing of curators to add their stamp to the Sculpture Garden. Along with Anthony Paul, curator Vikki Leedham will be assembling this year's exhibition. on the 7th June 2015, 3pm - 5pm. Exhibition continues until the end of October 2015. 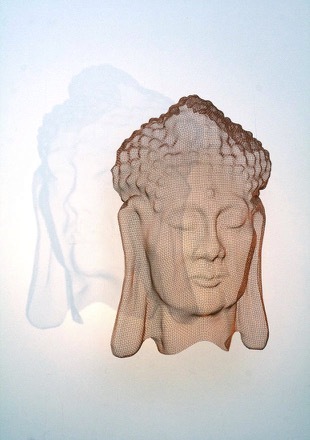 The Hannah Peschar Sculpture Garden 2015 with TUUSUM, a double figure in copper and Buddha Portrait , suspended. 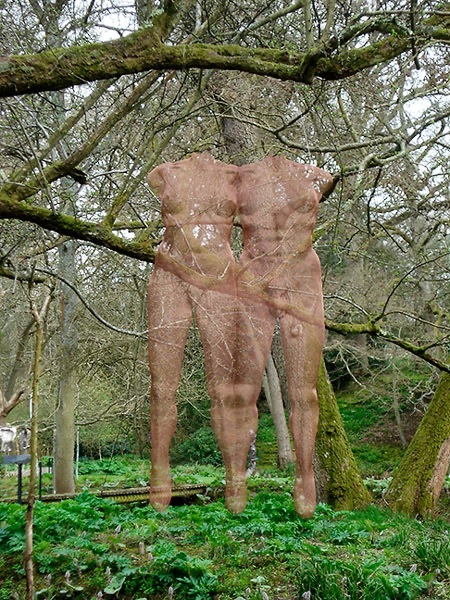 Watch this beautiful video by Vicki Leedham / Hannah Peschar Sculpture Garden. Stuart Anderson • Carole Andrews • John Atkin • Walter Bailey • Ben Barrell • Jay Battle • Stephen Beardsell • David Begbie • Hannah Bennett • Alison Berman • Jane Bohane • Stuart Bourne • Howard Bowcott • Peter Bye • Thiébaut Chagué • Stephen Duncan • Anthony Fagin • Richard Farrington • Robert Harding • Sean Henry • Heywood and Condie • Simon Hitchens • Richard Jackson & Sally Fawkes • Rick Kirby • David Klein • Martina Lauinger • Jonathan Loxley • Sophie Marsham • Malcolm Martin & Gaynor Dowling • Christopher Marvell • Ronald van der Meijs • Caroline Moiret • Liam O'Neill • Anthony Paul • David Price • Lambert Rocour • Sam Shendi • Michael Short • Tom Stogdon • Johannes von Stumm • Jilly Sutton • Paul Vanstone • Léon Vermunt • Patricia Volk • Neil Wilkin • Emily Young• Wijnand Zijlmans • and Peter Clarke. Other confirmed artists are: Alison Buckle, Calum Colvin, Rosie Dahlstrom, Graham Fagen, Nina Fowler, Tom Gallant, Shannon Laing, The Little Artists, David Mach, Harland Miller, Paul Morrison, Alexander Newley, Deirdre Nicholls, Mark Powell, Adrian Wiszniewski. 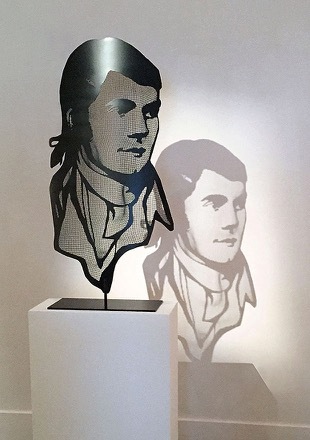 More info Robert Burns Birthplace Museum and Press Release, Media Release and an invitation/catalogue. PS: Robert Burns Night 2015: 25 January! 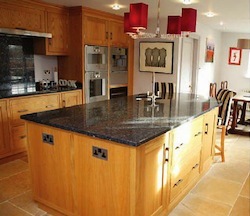 Tanner & Lawson moved to Burnham Market, Norfolk. The Old Forge, North Street, Burnham Market, Norfolk, PE31 8HG. It’s the tenth anniversary and a selection of my work will be exhibited with Lee Benson from Lee Benson Gallery (former Number Nine the Gallery, Birmingham). NUBII, 50 cm height, ICON III 51 cm height, ELEMENT - a brass panel on a metal base, height 32 cm and STILLNUWD, 62 cm height. 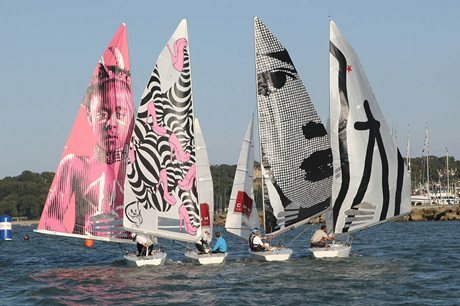 6 Stars competed in the 2014 edition of the Fine Art Sails Regatta, which was held in the premier sailing location in front of the Green in Cowes, during Cowes Week. Whilst earlier in the day, Cowes Week racing had been abandoned due to fickle breeze, the Star’s start time of 1700 meant that they experienced champagne conditions of 12-14kts and glorious evening sunshine. This was the second edition of this unique event which was put together by RTYC member Peter Bonham-Christie, with Michael Ross and his CNM Estates Company, including my artwork “An Eye for the Buoys”, based on “EVE”, a steel panel suspended portrait in limited edition. Hannah Turcan, Interior Designer, presents her country property project. 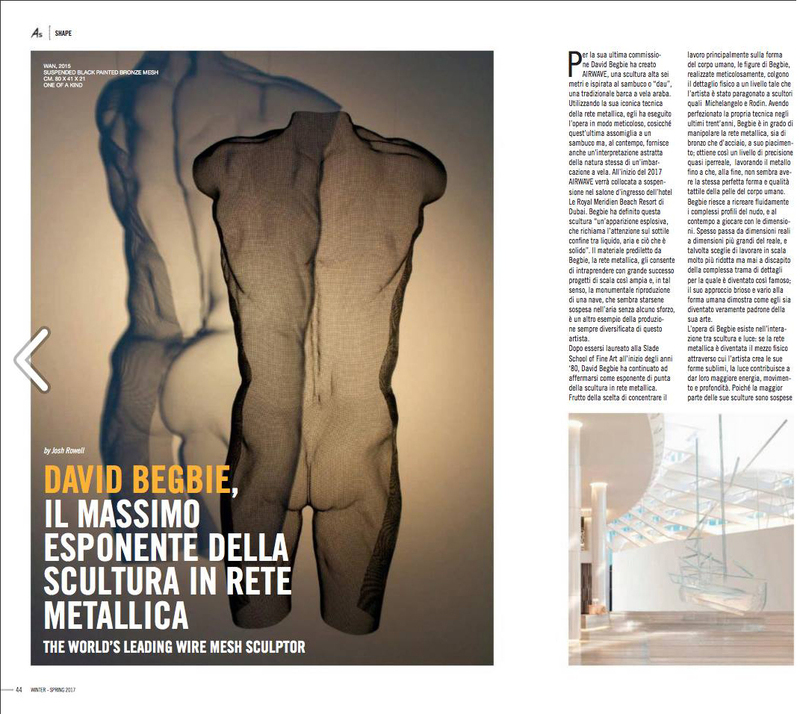 Many thanks to the owner for sharing fantastic images of his home, depicting NUUD (93 cm), a unique steelmesh sculpture and etching INTIMATES (limited edition). London will be playing host to its first Winter Pride on 8 February 2014 - a new mid-Winter festival for gay London, Winter Pride (winterprideuk.com) at the capital’s Tobacco Dock (http://tobaccodocklondon.com/): a historic location between Tower Hill and Wapping that has now been transformed into a major exhibitions space. Winter Pride will seek to bring together the biggest LGBT club brands and international DJs for a real winter warmer of a party, a fully enclosed, indoor event. It won’t just be about dancing and clubbing, though. The event will also boast a market and community area, and a highlight of the day will be the The Winter Pride UK Awards. The first ever Winter Pride includes not only an art competition for emerging artists but a breathtaking exhibition of installation art and sculpture from a diverse group of international artists.I am happy to be invited showing NUUDIS and other mesh sculpture at the Awards room! 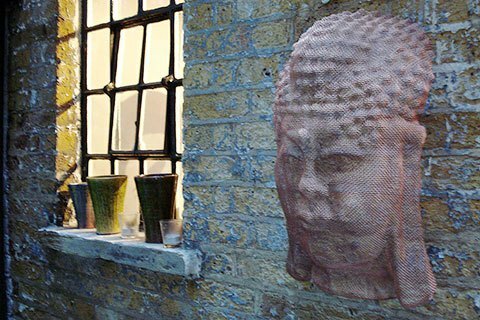 Video ‘Mostly Empty Space’ includes subtitles in different languages features an interview and the installation of my bronze-mesh Buddha sculpture at Buddha-Bar, Knightsbridge, London. Many thanks to Jonathan Cronin for a professional and clever production as well as to Heathcliff Blair for the soundtrack! Congratulations to Jonathan Cronin, who was in the top ten at the 'MOVIE MACHINE DIGITAL CINEMA FESTIVAL with his 4 minute production about my work. Images of my installation of sculptures at Hannah Peschar Sculpture Garden - a fantastic sculpture park I highly recommend to visit. The season will open on 26 May 2013 (3-5pm). A weekend of Fine Art Sails* racing at the London Boat Show 2013 was won by the boat and crew with my sail 'An Eye for the Buoys’. Michael Ross' official CNM Estates UK Star Championship regatta award went to Xavier Rohart and Serge Pulfer. 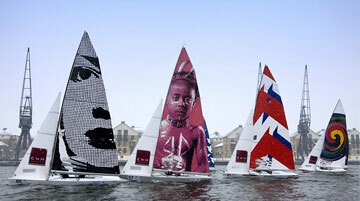 Fine Art Sails is the first-of-its-kind collaboration between World Class Yachting and Internationally acclaimed artists. Established in 2012 by concept founder Michael Ross of CNM Estates, Fine Art Sails invites artists to create original artwork sails. I am delighted to take part! My artwork for the sail is derived from 'EVE' 2008, a limited edition flat steel-panel sculpture translated into a sail format. I am particularly impressed by how the origins of the 'Art Sails' idea have transformed from street art and graffiti painting into the initiation of a completely new art form, literally inventing a new 'canvas' on which artists are invited to work. I'm also simply amazed at the momentum and speed at which this project has moved and gathered force since it began in 2012. The ethos of the 'Art Sails' concept and of Michael Ross' desire to draw together the seemingly disparate worlds of nautical sailing and 'the Arts' is potentially as versatile and expansive as the invited artists can make this concept themselves, culminating in an artwork of truly magnificent proportions. I am pleased and honoured to take part and as the image I have created for this project is derived from an existing sculpture, which in itself is originated from a tiny passport photo, this demonstrates how adaptable and surprising the 'Art Sails' concept actually is. 145 Knightsbridge was the location of choice for a fabulous fashion spread in OK! 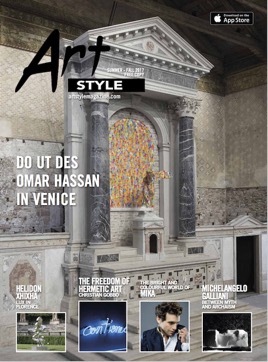 Magazine with latest trends (Issue 874, April 16th 2013). 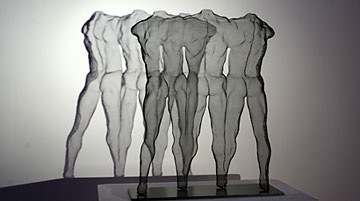 All images of this sculpture on page PROJECTS. 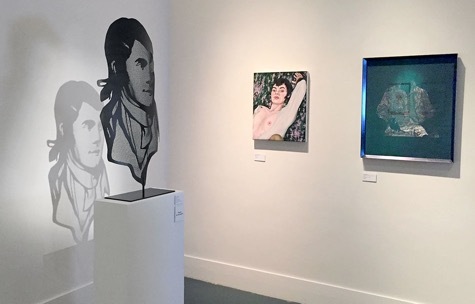 A selection of my work including steel panel portraits EVE, BURNS and HEROINE, an Amy Winehouse portrait, all made from stainless steel. 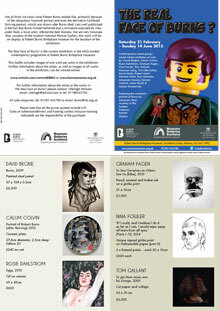 The exhibition features portraits and combines a range of very interesting styles from 7 very different artists. 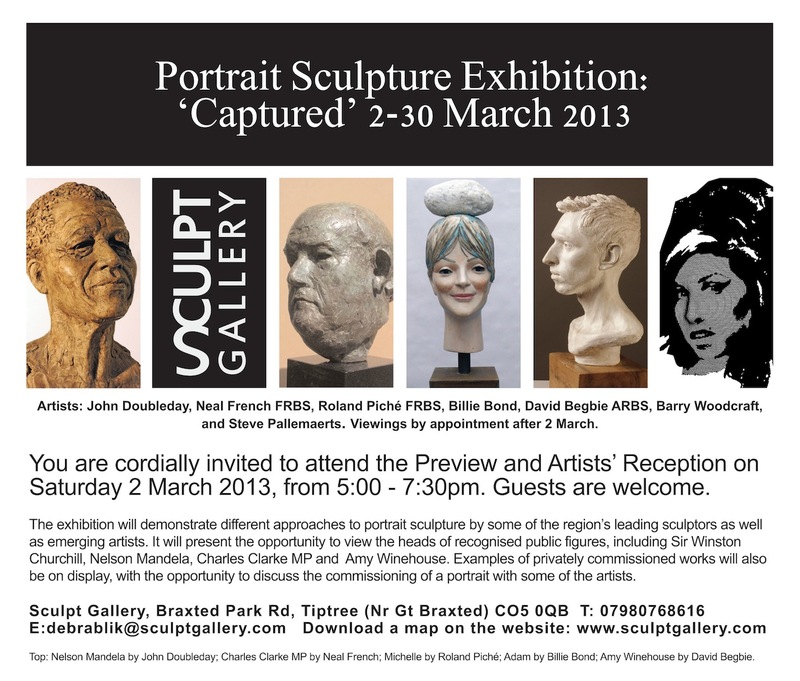 It runs until the 30th of March, in case you can't make it on the 2nd. It would be nice to catch up with you if you can make it to the Private View on 2nd of March, where I will also be present. I hope to see you then. 28th March - 21st April 2013 Gallery Byard Art will show recent work and I am looking forward to a visit to Cambridge again, where the gallery is based. If you are visiting Mayfair, London, it might be of interest for you to pay a visit to 'Mews of Mayfair'. The exquisite restaurant, bar and lounge is the new home of 'SOLA', a bronze-mesh angel sculpture (wing-span of 2,60 metres), thanks to Tanner & Lawson gallery, 59 Columbia Road, London E2, where you can see other examples of my new work and on a Sunday fight your way through the lively flower market to do so! 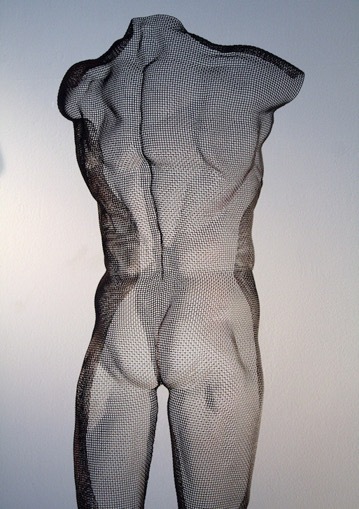 I am delighted that the Visitor's Choice Prize Cork Street Open Exhibition went to 'MANOMANOMAN' - my triple male composition in steelmesh. Many thanks to all visitors and to curator Kathryn Roberts! 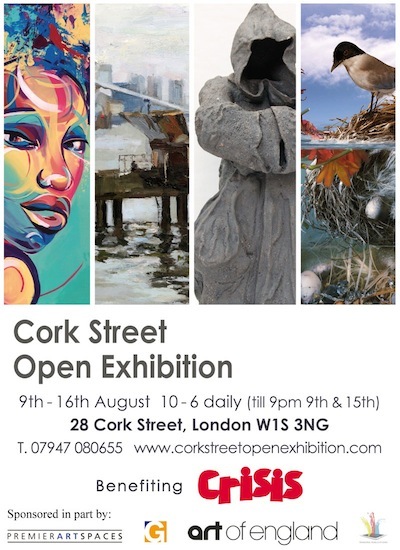 The CORK STREET OPEN WINTER EXHIBITION (free entrance) promises to be a spectacular show of International art. The Private View is a fund raiser for charity CRISIS. Tickets are £15 each / £25 per couple and include Miller's Gin, Mottra Caviar and a chance to preview and purchase the artwork before the exhibition opens to the public. Please note there are **two events for this exhibition**. I will only be present at the artists' reception on 23rd January 2013. Please let me know asap if you'd like to join me for this, we do have a limited number of tickets available.